There is possibly only one person in the world who knows what Mrs May intends to do – and that's Mrs May. But it is just as possible that she herself doesn't know what she's doing – or has simply run out of options. For the rest of us, though, we have no way of knowing the difference. Not even the media "in-crowd" have any idea of what is going down so, like the rest of us mere mortals, they are reduced to speculating – some at greater length than others. Needless to say, this is a highly unsatisfactory situation. Despite following the Brexit drama since its inception, I personally have no more idea of what might happen than the proverbial man in the street. Anybody's guess is as good as mine. We might as well flip a coin. That said, if I was forced to put money on the outcome, it would be the no-deal scenario – occasioned simply because Mrs May had failed to get the Withdrawal Agreement ratified, and parliament didn't have the wit to call a halt to the madness into which we're descending. If it's any comfort, the "colleagues" don't have a much better idea of what's going to happen than we do, illustrated by yesterday's press conference with Xavier Bettel, prime minister of Luxembourg, and Michel Barnier. Barnier picked up on the theme introduced by a series of slides published earlier in the day, explaining the Withdrawal Agreement – sixty sheets in document form, including the cover sheet. The slides start with a statement from Barnier, drawn from 25 November when the Withdrawal Agreement was finalised. It has him saying: "We have negotiated with the UK, never against the UK. This deal is a necessary step to build trust between the UK and the EU. We need to build, in the next phase, an unprecedented and ambitious partnership. The UK will remain our friend, our partner and our ally". It looks here as if the EU is getting in its narrative first – not sitting back waiting to take the blame for the collapse of the deal. And, in Luxembourg, Barnier starts off in much the same way, saying that the Withdrawal Agreement was negotiated with the UK, not against it. The EU has no intention of punishing the UK or acting against it. The backstop, Barnier says, was agreed but the future is not one where they envisage putting it into effect. Using the political declaration they look forward to working out a future relationship between the EU and the UK as partners, as friends. However, embedded in the velvet glove is the steel fist. The EU needs the border in Ireland to protect the safety of its citizens, to protect their industry by ensuring that their conformity is maintained. They cannot – and therefore will not - allow goods to enter Ireland from the UK without controls. Brexit, the retrait ordonné (orderly withdrawal) was agreed with the UK, with Mrs May herself. It was agreed with the countries of the EU and cannot be renegotiated. And so, the EU still hopes for an orderly withdrawal but it must prepare for every scenario, including a no-deal. And so endeth one of a series of flat statements, repeating what has gone before, with a resigned acknowledgement that the EU is reconciled to the worst outcome. One almost gets a sense of fin de siècle. There is no last-minute appeal to rationality, or any suggestions as to how things might proceed. All we got was a warning. "Something has to give," Barnier said, with a reminder that the time left was "extremely short". The EU was "waiting for clarity and movement from the United Kingdom", something that Barnier must know that he is not going to get. Back home, we still get endless prattle from the media about parliament introducing a motion to "block" a no-deal, a move which – if pursued – will indicate that parliament has failed to understand the limits of its own power, alongside the media's inability to appreciate the finer points of our constitution. As it stands, no-deal remains the default under Article 50, leaving open only three possibilities if it is to be prevented from taking effect automatically on 29 March. The first is the one we've more or less written off – the ratification of the Withdrawal Agreement by parliament sometime before the date. There is even talk of this happening within the last days of March, which is a possibility. But there is no second-guessing the mood of parliament. A troop of baboons would be easier to predict. A second option, one that has been well rehearsed, is the delaying action: seeking an extension to the Article 50 period. Some appear to assume that all we have to do is ask and it will be granted. But the unanimous assent of the EU-27 is required. This cannot be taken for granted and the price demanded might be unacceptable – even if an agreement was in the offing. That leaves option number three, the unilateral revocation of the Article 50 notification – stopping the Brexit process in its tracks. But this is not for parliament to decide. The confrontation was skirted last time but, if a vote instructing the executive to take this option ever succeeded, it would precipitate a constitutional crisis. The power to revoke the notification rests with the prime minister as the custodian of residual crown prerogative. It is not for parliament to intervene. Take down all three and leaves us where we started, looking down the nose of a no deal – but not just yet. Today, if the Guardian has it right, Mrs May is going to indulge us with her latest round of can-kicking. 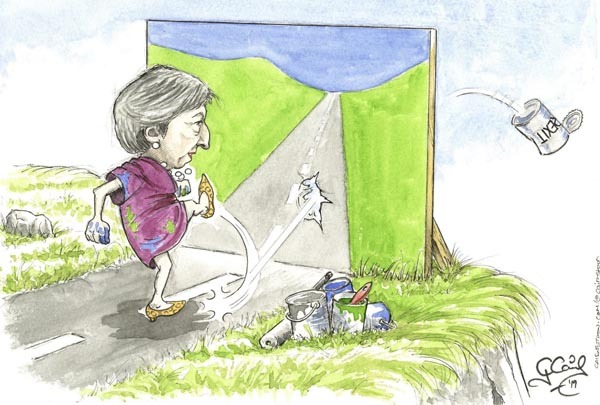 She is to ask the Commons to give her another fortnight's grace to keep up what amounts to the pretence that she is renegotiating the backstop. This, I suppose, beats Jeremy Corbyn's pretence that he is capable of making an intelligent contribution to the Brexit debate, so much so that the prime minister is casting him adrift. Labour wrote itself out of the script right at the beginning and that's where it intends to stay. It is not even worth the time and effort charting the convolutions emerging from that quarter. For us mere mortals there is no escape from the eternal soap opera presented to us by a media desperate to keep some sort of narrative going. Thus we are assailed with endless speculation, titillated by court gossip and lectured by knowing commentators, all with the intention of projecting the impression that it is possible to know the unknowable. Just occasionally, it would not hurt to return to earth and address the most straightforward of issues: there is only one certain way to avoid a hard deal, and that is for parliament to ratify the Withdrawal Agreement when (or if) it is again submitted to a vote. At the moment, we don't even know when that will be, or under what terms. Even now, having left it so late, the damage will be incalculable. But that is the price of allowing our political system to disintegrate, letting the morons take over. In a situation replete with so much irony though, one simply cannot ignore yesterday's editorial in the Telegraph, where the teenage scribbler responsible complains about the lack of activity in parliament and argues that, if we really are heading for no-deal, this week should be crammed full of the legislation that will be needed to ensure that a no-deal "can happen relatively smoothly" on 29 March. This, of course, is the newspaper which, perhaps more than any other, has embraced the idea of a no-deal so it would have a vested interest in making it work "relatively smoothly". But, if we are anywhere near close to understanding the ramifications, any belief that a no-deal could be "relatively smooth" is absurd. Still, with less than 50 days to go, we have a new game in town. We stand poised on the brink of the precipice, scanning the horizon for the last-minute miracle that will drag us back from the edge and make everything right. Doubtless, there is a deep-seated belief that, like the Hollywood westerns of old, the US Cavalry will come charging over the hill, just at the point when everything looks lost, and save us from the ravaging Indians. Just nobody please mention Little Bighorn or General Custer. The nation is in the market for fairy tales, not gritty realism, as we go through the motions of giving a damn. Cartoon: Chris Cairns@cairnstoon - commissioned and first published by Wings Over Scotland, 9 February 2019.